Surface Insulation Resistance (SIR) tests measure the post soldering effect on the electrical integrity of the circuit boards. Fluxes should facilitate soldering, but not degrade the circuit by allowing an electrically conductive path between the components or circuitry. In general, rosin-based no-clean fluxes should not degrade or enhance the insulation between circuit elements. Non-rosin fluxes may degrade the insulation between circuit elements, but not to the point where the circuit will short out. Depending on the time when a wave flux was released to the market, it may have been evaluated using different temperature and humidity conditions. The most recent J-STD-004B test conditions are considered to be the most severe (low voltage, moderate temperature, and very high humidity) since those conditions seem to be the ideal environment necessary for growing dendrites (conductive crystals) between conductive paths. Earlier versions of the J-STD tested circuits with higher voltages, higher temperatures, and slightly lower humidity. While severe, the decreasing insulation values are not the ideal conditions for growing dendrites. Regardless of the test used, the minimum SIR value assumed to preserve circuit electrical integrity is 100 megohms, represented by the red line on each of the graphs. 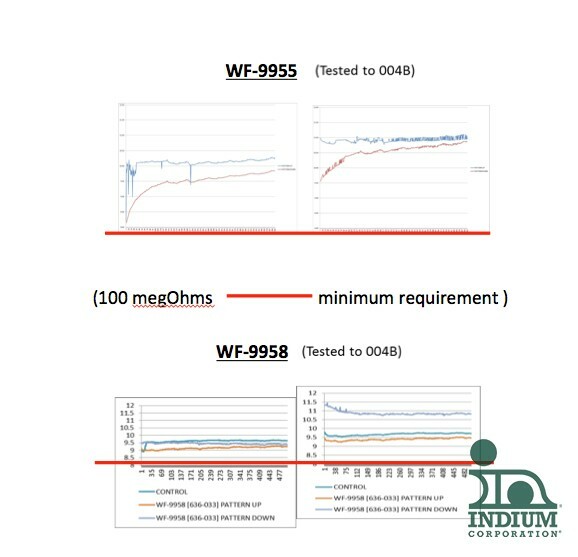 You will notice that there are two sets of readings and two different graphs measuring SIR performance, whereas with a solder paste or cored wire flux you'd only see one line. In order to mimic the conditions of a wave soldered circuit board, where wave flux is sprayed on the bottom of the circuit board and can travel up to the top of the circuit board through the through-holes and vias, the fluxes are tested both pattern down and pattern up. Pattern down measures the flux on the bottom side of the board, which passing through the soldering wave. Pattern up measures the flux on the topside of the board. These fluxes have been activated, but have not experienced the heat or wiping action of the solder wave. Does the flux pass the test? In other words, are the readings higher than 100 megohms? Which flux is better at maintaining electrical integrity of the circuit board? 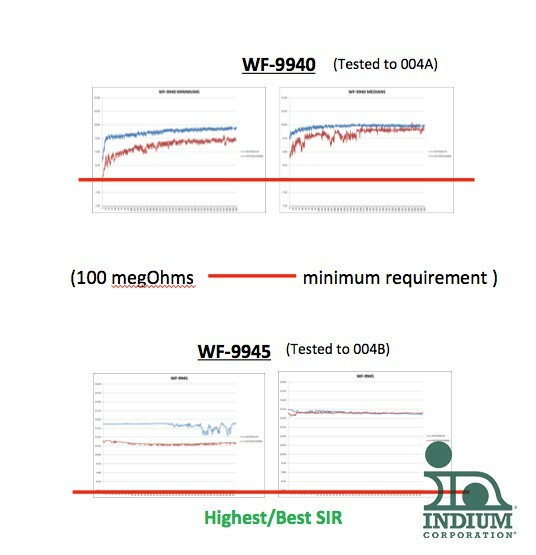 The higher the readings, the more they exceed the 100 megohm limit, which will give you better electrical performance (less noise and risk of shorts).